Exuding a timeless elegance that takes visitors back to a bygone era, the Kingsley Inn is a charming bed and breakfast-style inn in the heart of Fort Madison, Iowa. Rich in history, the once-commercial building, has been lovingly transformed into an inviting bed and breakfast offering spacious accommodations that invoke a Victorian age and charm. Guest rooms boast high ceilings, private bathrooms, and modern amenities, and comfortably furnished communal rooms provide tranquil places in which to relax with a book or socialize with other guests. 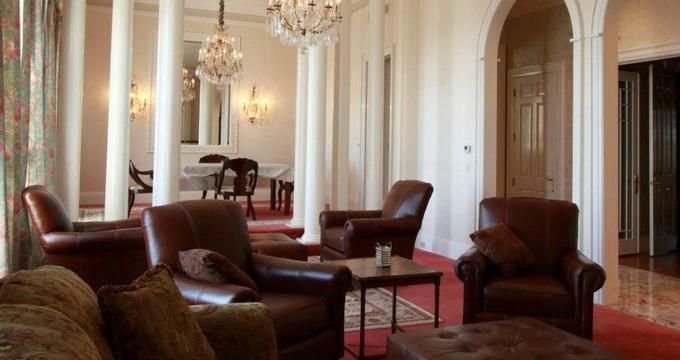 A delicious complimentary breakfast is served every morning in the formal dining room, and other facilities at the Inn include access to a Club Room with a billiards table, a morning room with coffee and tea for early risers, and a parlor with a baby grand piano for gathering in the evenings. There is also free high-speed wireless Internet throughout the property. The Kingsley Inn is situated within walking distance of the attractions and activities that Fort Madison has to offer, including the Riverview Park and the Mississippi River. The Kingsley Inn features 18 well-appointed and stylishly decorated guest rooms and suites that boast sumptuous décor and Victorian furnishings. Rooms and suites are spacious, and light with high ceilings and span between 300 and 500 square feet in size and are available in Standard Queen and King Rooms, Deluxe Rooms with Spa Baths or Fireplaces, King’s Suites, a Governor’s Suite, and a Two-Bedroom Suite for families. They all offer king or queen-size pillow-beds dressed in high-quality linens, down comforters, and hypoallergenic pillows, and en-suite bathrooms with shower/bath combinations, single vanities, large mirrors, fresh towels, terry bathrobes (on request), and branded bath products. Modern amenities include flat-screen televisions with cable channels, state-of-the-art sound systems, hairdryers and irons and ironing boards (on demand), and complimentary wireless Internet. The Governor's Suite offers extra levels of luxury and privacy and features a master bedroom with a king-size bed dressed in high-quality linens, down comforters, and hypoallergenic pillows, and a master en-suite bathroom with a spa bathtub, walk-in shower, fresh towels, terry bathrobes (on request), and branded bath products. The spacious suite also offers a living and dining room, a fully equipped kitchen, a butler’s pantry, laundry and powder room, and access to the Atrium boardroom and an outside deck on the third floor of the inn with incredible views over the Mississippi River and Old Fort Madison. The Kingsley Inn is home to the Atlas Steak and Smokehouse, which serves a comprehensive menu of delicious Southeastern cuisine in a casual and relaxed setting. Dark wood interiors and stylish tables and chairs create a sophisticated vibe, and large windows offer gorgeous views of the Mississippi River. A complimentary continental-style breakfast is served every morning in the Morning Room and includes freshly baked bread and pastries, seasonal fruit, cereals and homemade granola, yogurt, fruit juices, freshly brewed coffee, and tea. Amenities and facilities at the Kingsley Inn include access to a Club Room with a billiards table, a morning room with coffee and tea for early risers, and a parlor with a baby grand piano for gathering in the evenings. There is also free high-speed wireless Internet throughout the property, and a complimentary continental-style breakfast is served in the Morning Room. Located along the Mississippi River in the Southeast corner of Iowa, Fort Madison was established around the site of the Historic Fort Madison in the early 1800s and has grown to become a vibrant town with plenty of things to see and do. Visit a replica of the original Historic Fort Madison situated along the river in Riverview Park and learn about how the fort was built to control trade and pacify Native Americans in the area. Other exciting attractions include the Sheaffer Pen Museum, the oldest prison west of the Mississippi, the longest double deck swing-span bridge, the annual Hot Air Balloon festival, and the Tri-State Rodeo, which is held every year in celebration of the town’s unique agrarian culture. The Kingsley Inn can accommodate business meetings and corporate gatherings with several ideal venues, such as the Club Room, which has auditorium and classroom seating for up to 50 people and banquet space for up to 48 people. This room also features a comfortable lounge area and a billiard table for recreational and relaxation. The Morning Room offers space for small meetings and conferences for up to 28 people with conference-call speakerphone capabilities available.